Line from the film: "We'll be rich, Ali... and we'll buy ourselves a little piece of heaven"
One of the most prolific filmmakers of all-time, Rainer Werner Fassbinder directed over 40 movies (two of which were television miniseries) before dying of a drug overdose at the age of 37. Having aligned himself with the New German Cinema (a group that included Werner Herzog, Wim Wenders, and Margarethe Von Trotta, among others), which drew inspiration from the French New Wave, Fassbinder worked quickly and with smaller budgets, yet still managed to turn out one remarkable motion picture after another. 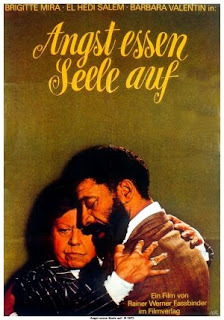 Shot in only 15 days, 1974’s Ali: Fear Eats the Soul ranks as one of Fassbinder’s most acclaimed films, and was a tribute to fellow German Douglas Sirk, more specifically Sirk’s 1955 classic All That Heaven Allows. To get out of the rain one evening, Emmi (Brigitte Mira), a widowed cleaning woman in her mid-60s, walks into a small neighborhood bar, where she meets Ali (El Hedi ben Salem), a Moroccan laborer who is half her age. Recognizing the loneliness in each others' eyes, Emmi and Ali become romantically involved, and eventually marry. Far from being happy that Emmi has found a mate, the people in her life, including her neighbors, co-workers, and even her own children, turn against her, many unable to accept the fact that she married a foreigner (and a black one at that). Is Emmi’s and Ali’s love strong enough to survive this onslaught, or will it drive them apart? Lacking the funds that Sirk had at his disposal for All That Heaven Allows, Fassbinder’s Ali: Fear Eats the Soul has a rough, unpolished feel to it, yet the emotional impact of the story is every bit as poignant as what’s presented in that 1955 Hollywood classic. When Emmi introduces new husband Ali to her adult children: Krista (Irm Hermann), Bruno (Peter Gauhe), and Albert (Karl Scheydt), all three react angrily to the news (Bruno goes so far as to kick in Emmi’s television set); and the other tenants in Emmi’s apartment building, many of whom she’s known for years, are suddenly cold and distant. Even the owner of the local grocery store, a man named Angermayer (Walter Sedlmayr), shows his disapproval by refusing to serve Ali when he attempts to buy margarine. By way of some wonderfully framed long shots, Fassbinder conveys the isolation that the newlyweds experience on a daily basis, and though she tries to remain strong, it’s sometimes more than Emmi can bear. As with Cary and Ron in All That Heaven Allows, we feel for Emmi and Ali, and root for them to overcome all the negativity in their lives.